Good For You Girls Skincare was created exclusively for young skin with spa quality formulas and safe, 100% natural, organic ingredients. This creative skincare line was specifically formulated for the specific needs of young girls and is a three step process of cleansing, toning and moisturizing. Each Complete Kit lasts between four and six months and the company offers 100% money back guarantee if your satisfied with their products. My preteen daughter tried out the skincare products for the review and this was her experience. We received the Good For Your Girls Blemish Kit which contains the Blemish Wash, Purifying Toner and Oil-Free Moisturizer. Each product is 4 fl. oz. The Blemish Cleanser is for blemished and oily skin. It effectively washed away her skin's impurities with a soothing lather that didn't irritate her skin and reduced redness and poor size. The benficial botanical ingredients are: (Willow Herb, Papaya, Meadowsweet, Aloe, Calendula, Chamomile and Vitamin E). The Refreshing Toner is for all skin types. It cleaned her pores while organic botanicals balanced her skin's pH balance and left her skin feeling completely refreshed and clean. The beneficial botanical ingredients are: (Witch Hazel, Aloe, Meadowsweet, Lavendar, Chamomile, Vitamin C, White, Green and Black Tea). The Oil-Free Moisturizer is for all skin types. It protected her skin from losing moisture while replenishingvital nutrients without clogging her pores and prevented her skin from shine throughout the day. The beneifcial botanical ingredients are: (Chamomile, Aloe, Calendula, Borage, Flax and Rose Hip Oil, Vitamin B6, White, Green and Black Tea). Overall she is very happy with the products and would recommend them to a friend. I would definitely buy Good For You Girls Skincare for my daugther again and I love that she is finally using a natural, safe organic skincare line I can feel good about! 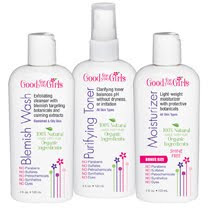 Good For You Girls does not contain any synthetics, parabens, petrochemicals, dyes or irritants. So why not try it? With a money back guarantee, there is nothing to loose and only good skin to gain. Please visit their website at: www.goodforyougirls.com.